Partners in Crime by Kim Harrington, a Mysterious Review. 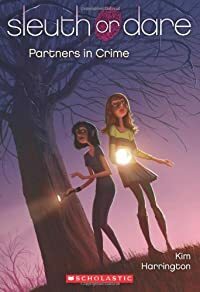 Review: Best friends Norah Burridge and Darcy Carter come up with an idea for a school project, a private detective agency, only to discover that an anonymous party believes them to be actual investigators and wants the girls' help finding a missing twin in Partners in Crime, the first mystery in this middle grade series by Kim Harrington. Though Darcy created a website for their class assignment to give their company a sense of legitimacy, she hacked into the school's computer to host it; it was never "live" to the world. So their first clue as to who contacted them is that it must be someone in the school, more specifically, someone in their class, who saw their presentation. Using deductive reasoning — and a little help from a boy Norah has just the tiniest crush on — they learn their new client's name: Fiona Fanning, one of the most popular girls in Danville Middle School. She had accidentally come across two birth certificates in her house for two girls born on the same day in the same place but with different names: Fiona Fanning and Bailey Banks. There were even photos of the two girls, nearly identical in appearance. Fiona is convinced she has a twin sister somewhere but is too afraid to ask her parents about what she has found, and hopes that Norah and Darcy can help her learn what happened to Bailey. Norah and Darcy are creatively drawn characters, Norah the careful, methodical one and Darcy more of an "act now, ask questions … or permission later" kind of girl. They are well matched and make for a good team. Their first case, however, isn't quite as strong, plot-wise, as it could be. It's never quite clear, for example, why Fiona kept her identity a secret at first … or why she couldn't have pursued her own investigation as to the whereabouts of her presumed missing twin. Still, the action moves swiftly forward as the girls proceed along a smartly thought out, reasoned path, using resources available to them and drawing logical conclusions from what they learn. Middle grade readers will no doubt enjoy tagging along with Norah and Darcy as they discover the truth behind their classmate's mystery … and will look forward to the girls' future cases. Acknowledgment: Scholastic provided an ARC of Partners in Crime for this review.